The closing months of war in Burma have witnessed East and West African soldiers fighting with great valour under British command, earning them the respect of their European and Asian comrades-in-arms and a place in the nightmares of the surviving Japanese enemy. But Africa holds a bigger enigma for Burma than these hitherto-unknown fighters. 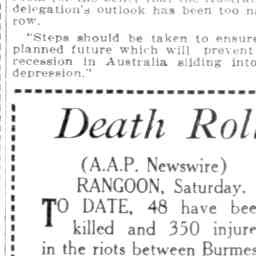 Back when the War or his nom de guerre, ‘Galon U Saw,’ in honour of the anti-British rebel Saya San), the most successful politician under Burma’s 1935 Constitution, in Uganda, where he has languished in prison ever since. 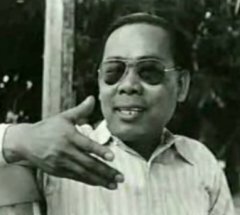 Acting as if he were the head of state of an independent nation, he had attempted to negotiate secretly with the Japanese while on an overseas trip after receiving scant encouragement on his proposals for Burma’s self-rule from either Prime Minister Churchill or President Roosevelt. Saw will likely return from Uganda to his homeland soon, anxious to re-enter the fray after four years of twiddling his thumbs in jail. We can only wonder: will his return trouble this already much-troubled land, or will he act responsibly in cooperation with British authorities and Burma’s other political forces to bring a peaceful resolution to the issue of the country’s future? Given the man’s towering self-regard and violent ambition, we can only imagine that the former is more likely to be the case than the latter. Saw faces the predicament of the ham that has been kept too long in the smokehouse. Others have stepped into the centre of the political stage, eclipsing his pre-war popularity, especially ‘Bogyoke’ Aung San, his bitter rival since the late 1930s. 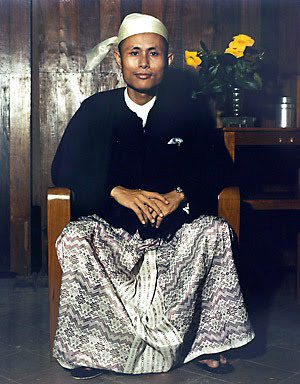 After turning against his Japanese allies at the last conceivable moment, Aung San charmed Lord Louis Mountbatten, head of the South-East Asian Command, and has dodged charges of collaboration by convincing much of the public that he is battling both (Japanese) fascism and (British) colonialism, all summed up in the name of his broad leftist coalition: the ‘Anti-Fascist People’s Freedom League’. U Saw, a consummate politician, combines the talents of the rabble-rouser (for example when used his newspaper, The Sun, to provoke the Burman mass es against the Indian migrants, especially Muslims, during the 1938 riots) with those of the backroom dealer (lining up financial support from wealthy Burman landowners and entrepreneurs as well as major funding from the Japanese). The ace up his sleeve, however, is the esteem with which conservative Brits view him, a ‘loveable rascal’ who presses them – especially Governor Dorman-Smith – with expensive whiskey and well-aimed flattery. The old colonialists both fear and despise Aung San, and nothing would suit them better than using Saw to oust the ‘Bogyoke’ from his high perch on the platform of the Shwe Dagon Pagoda (where he is in the habit of giving speeches). Key to Saw’s future success is his old chum, Dorman-Smith. If the Governor can make the proposals outlined in the Conservatives’ White Paper stick, he and Saw could form a partnership to assure that Burma will maintain pro-business policies not much different from those of the colonial era. This arrangement would be very good for Saw, but whether it is good for Burma is quite another matter.